The US treasury market continues to be an enigma. One way to see the disconnect between treasuries and other markets is to look at one of those historical scatter plots. In particular it is helpful to compare the price action in treasuries vs. the US corporate credit markets. The scatter plot below shows 10-year treasury yield vs. the 5-year investment grade (IG) CDX (index of corporate CDS) spread over the past year (longer periods look similar). 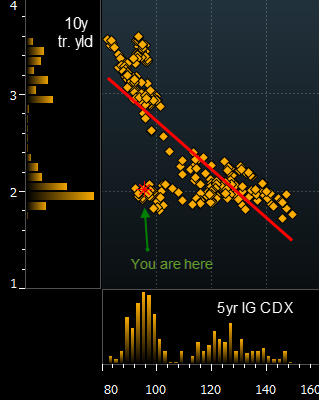 The current pricing, with the 10-year treasury yield at 2% and IG CDX at 95 bp, is clearly an outlier. In effect the treasury market is pricing in an economic slowdown while credit spreads are pointing to an expansion. It's a definite disconnect. But the 2% treasury yield is more of a suspect than the 95 bp investment grade spread because inflation expectations continue to rise. 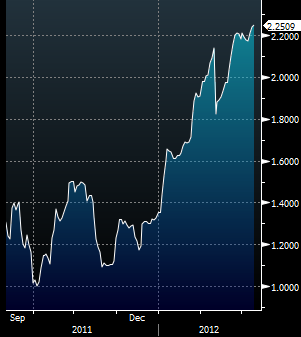 The 2-year forward (2x2 breakeven) inflation expectation is now at 2.25%. If corporate spreads remain stable, is only a matter of time before treasury yields move closer to the red line (higher) in the chart above. Short 10-year treasuries and long IG CDX protection is one way to take advantage of this disconnect in the markets.